Bishop Wilton is a small village and civil parish in the East Riding of Yorkshire, England. It is situated approximately 4 miles (6 km) north of Pocklington and 6 miles (10 km) east of Stamford Bridge. 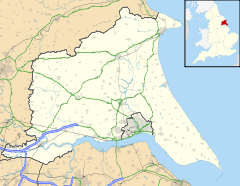 The civil parish is formed by the village of Bishop Wilton and the hamlets of Gowthorpe and Youlthorpe. According to the 2011 UK census, Bishop Wilton parish had a population of 554 in 227 households, an increase on the 2001 UK census figure of 500 in 199 households. Just north of the village lies Bishop Wilton Wold, more commonly referred to as Garrowby Hill. At 807 feet (246 m) above sea level, it is the highest point on the Yorkshire Wolds. Through the centre of Bishop Wilton runs a shallow beck, flanked on both sides by open grass verges that serve as a habitat for endangered wildlife including water voles, toads and newts. The village has a local shop, a small primary school, an art gallery with screen printing workshop, and the Fleece Inn public house. St Edith's, the medieval Church of England parish church, is dedicated to Edith of Wilton. The church was restored in 1858–59 with internal embellishment to designs by J. L. Pearson. It was designated a Grade I listed building in January 1967 and is now recorded in the National Heritage List for England, maintained by Historic England. The church is on the Sykes Churches Trail devised by the East Yorkshire Churches Group. Around the village there are walks on the Wolds with views across the Vale of York. ^ a b UK Census (2011). "Local Area Report – Bishop Wilton Parish (1170211146)". Nomis. Office for National Statistics. Retrieved 15 February 2018. ^ UK Census (2001). "Local Area Report – Bishop Wilton Parish (1543504193)". Nomis. Office for National Statistics. Retrieved 25 November 2018. ^ Pratt, Kate (8 February 2006). "St Edith" (PDF). Retrieved 30 January 2011. ^ Historic England. "Church of St Edith (1083868)". National Heritage List for England. Retrieved 27 June 2013. ^ "Sykes Churches Trail Southern Route". Beverley, East Yorkshire: East Yorkshire Historic Churches Group. This page was last edited on 25 November 2018, at 21:17 (UTC).